Mystic Ridge offers a luxurious and private cabin setting while seated high atop a mountain in the desirable Homestead Resort area. 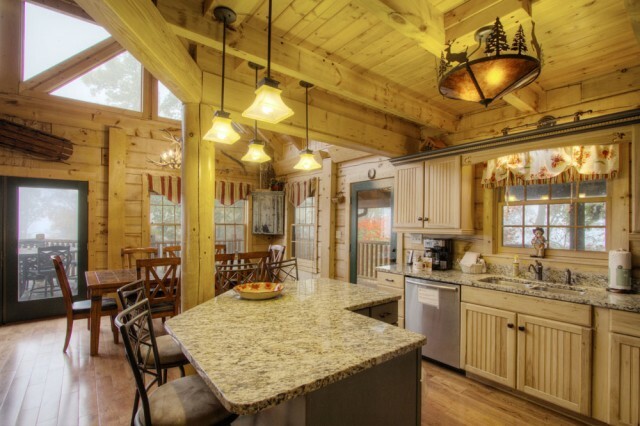 Take in 180 degree views of the Smoky Mountains from the large, relaxing hot tub or one of the rocking chairs on the spacious decks of your very own Wears Valley Cabin. Mystic Ridge is one of our cabins of the Smoky Mountains that offers total privacy, beautiful views overlooking the gorgeous mountains, and all of the modern and upscale amenities you would expect of a cabin of this caliber. The huge game room with pool table and big screen TV is a great destination to take part in some friendly competition during your stay. The main level offers additional entertaining areas with a large family room with adjoining dining area and fully equipped kitchen. The master suite is located on the main level, as well as an additional half bath. Downstairs you have another small kitchenette area as well as another seating area with a large TV, perfect for some late night fun. The main level and lower levels both offer great deck access. Upstairs you will find a quiet sitting area that creates the perfect oasis for parents to escape and cozy up with a good book. In addition you will find two more bedrooms, one with a queen bed and private bath. The other bedroom offers two twin size beds perfect for late night giggles from the kids. You will find joy in listening to the laughter from your children knowing that you made the best decision by selecting a cabin of the Smoky Mountains for this family vacation. A vacation to Wears Valley is just what the doctor ordered and will be a trip your family will reminisce on for years to come! Create a lifetime’s worth of memories with your loved ones while nestled deep in the Smoky Mountains this fall. The vibrant colors, cozy fireplace and quality time together will warm your heart as you head into the cooler months. We look forward to hosting you for a magical getaway such as this! Visit our website to book Mystic Ridge or continue browsing our full selection of Wears Valley cabin rentals to find the one that is perfect for you!